From Super7. The iconic Masters of the Universe toys re-imagined as 3.75' action figures from the golden age! 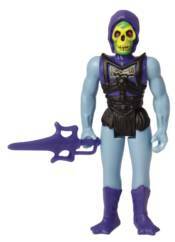 This edition of Battle Armor Skeletor features him battle damaged after another fisticuffs with He-Man and his allies. MASTER OF THE UNIVERSE WAVE 1 3� ACTION VINYLS MASTERS OF THE UNIVERSE PRINCE ADAM & CRINGER SPECIALTY SERIES EXCLUSIVE VYNL. MASTERS OF THE UNIVERSE FAKER US EXCLUSIVE DORBZ [RS] MASTERS OF THE UNIVERSE HE-MAN & TRAPJAW VYNL.